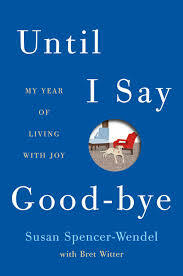 a book chick: "Until I Say Good-bye"
my take: After seeing a segment on the Today Show (and mopping my tears), I hopped on Amazon to order this. I'd been looking for a little inspiration in my life ... middle-age-ness getting me down. Time to fire up! Do something great! Get on "the path that leads to awesome" (Kid President). I liked this but didn't love it. And wasn't terribly inspired by it. Maybe because I had an idea what it should be - or what I needed it to be. My baggage and needs aside, it is an interesting story, typed on an iPhone. In addition to having ALS, this woman's quest for a great year of saying good-bye is thwarted at almost every turn. Which makes it an inspiring tale of a very humble kind. I liked the premise, but wasn't wowed by the writing (the author was a court reporter/newswoman). It did lead to good discussions with hubby on what we'd do with our family if we had a year to say good-bye. Now to act on some of those even though we don't need it right now. my verdict: Good. Not great. Probably still worth a read.